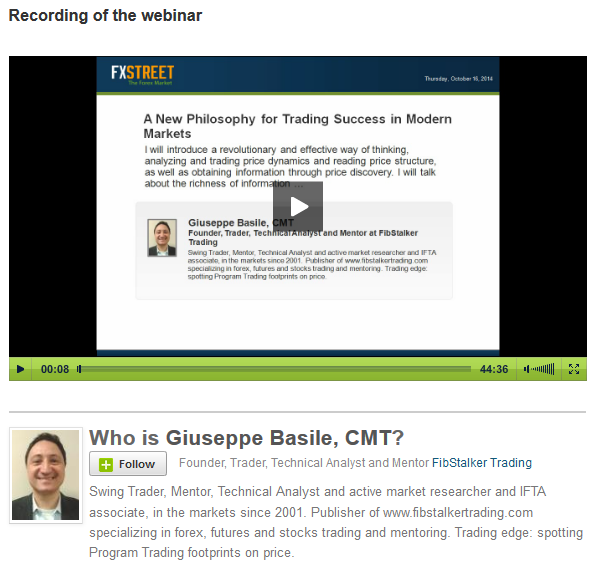 Yesterday I held a Webinar for FXStreet.com titled “Practical Considerations on the effects of HFT on price“. Closed with an example of HFT “disturbing” a well-formed setup of a Program Trading algos. Why am I so interested in HFT if, as retail traders, we cannot leverage them to our advantage? HFT algos run on specialize technical infrastructure and networks that are attached to the main electronic exchanges. Therefore, there is no way we can compete with HFT. However it is important to know HFT and study what are its effects on price. Particularly HFT behavior is capable of modifying price structure and can “help” Market Crashes!!! This is why there is a lot of talking about HFT and whether they are “socially useful”. The debate surrounding high frequency trading has become increasingly heated, reflecting the varied perspectives on the ability (and desirability) of high frequency traders to move faster (and on the basis of potentially greater information) than other traders. In the past I have written about the contrarian view represented by Paul Krugman represents on HFT. But my interest in HFT – like my interest in trading – is practical. Why am I worried of HFT? Because I know how it can have impact and skew my edge. And what is my edge? If you do not know my work you may not know that I model effects of classes of Algorithms (other than HFT) on price. By doing that I can understand if/when/where Algos participates on price. At the end of last year I have studied a typical example of how HFT can “disturb” my trading setups. If you are interested you can read here the full article on the battle of HFT versus Program Trading. There are only few things that can be proven or are true about the markets. One of these is the existence of algorithms (which trade a very high volume, in some cases more than 80%) and they work on all time frames, in high volume markets, with clearly observable effects on price. And I am not talking only about HFT (High Frequency Trading) here. The good news is that we can leverage the Algos (other than HFT) on price and and obtain a powerful edge that can significantly improve our rate of success. Something that the application of Traditional Technical Analysis will never be able to provide. Click here to watch the webinar recording here, and then let me know what you think about it. We all know and see that way market price action has been “engineered” in the years in the concepts of Traditional Trading Analysis is varied and imaginative. From the “fathers” of technical analysis like Charles Dow to the concepts introduced by Gann, Elliot and more recently by Wilders, who is the responsible of the majority of the “art” still used today by professionals and retail traders alike. Are the methods and concepts of Traditional Technical Analysis successful? Unfortunately, the answer is a resounding “no”! The proof? Is in the statistics: 90% to 95% of traders lose consistently or breakeven. If they the method of Traditional Technical Analysis successful and the simple concepts of trendline, price patterns, indicators, average crossovers, etc. would be enough to consistently earn money in the markets, which is clearly not the case. Some people want you to believe that you can be successful with those methods, but you need discipline, which the majority of people do not have. You need to be a “yoga master”, otherwise you cannot trade successful. My advice: when you see them do not walk, run! How far from the truth? People still do a lot of things they do not love doing, but have the discipline to do it. Think of how many people hate their daily job and trading their time for dollars. Discipline is a byproduct of confidence, which does not come by acting like a machine or being a superhero with plenty of willpower. Confidence comes when there is comprehension and confirmation. Comprehension about the way you analyze price and take positions in the markets with low risk idea that almost immediately generate risk-free trade and how and when you take profits. Confirmation comes from seeing the same setup working again and again, following a well-defined, clear procedure. But the method of Traditional Technical Analysis tend to do exactly the opposite, they generate confusion and lack of confirmation. Why? Newbies and experienced traders – using several technique and indicators – think they see exactly the same patterns over and over. The reality is that in the analysis process they need to use a lot of discretion”, in order to reconcile the indications that come from the different studies and patterns they use. And then of course there are the charting specialists who have introduced many ways to help see patterns in price, like linear charts, HiLoClose Bar Charts, Japanese candlestick charts, Point & Figure, pivots, fractals, market profile, etc. 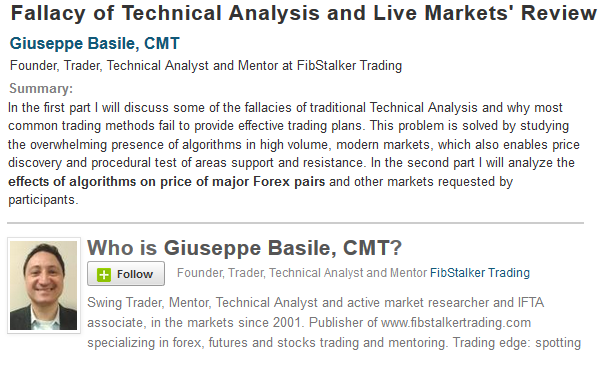 Hundreds of techniques, and today you can find lots of originally mutated techniques and methodologies available to the traders, the analysis and the ch”artist”. What many fail to realize, is that all the studies of traditional technical analysis, are no more than statistical tables plotted in graphic form to present a “picture” to assist traders in their decision process. These statistical tables are tools that are built on historical and lagging databases. Moreover the rigidity of the parameters used in the studies imposes rigid responses to changing market conditions. 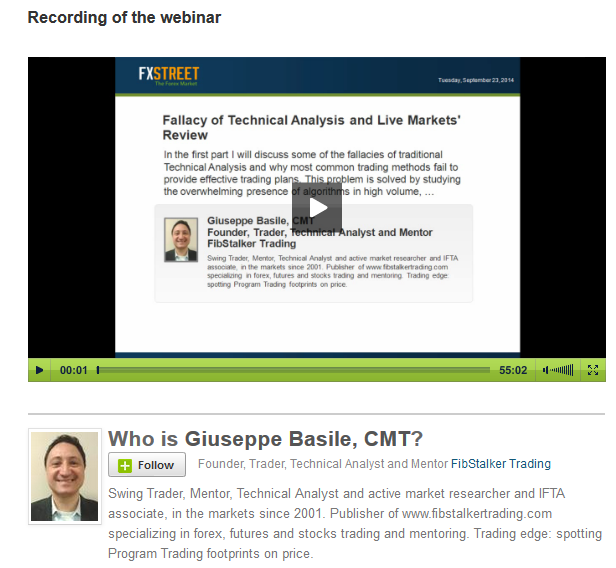 Have you forgotten that the market is a live beast that learns and adapts to trader behaviours? Mark Douglas, author of the great book ‘Trading in the Zone’, reminds us that the markets can do anything. Do you really believe you can cope with this principle and trade the markets with the aid of lagging derivatives of historical databases of price? I surely cannot, and believe me, I have studied and tried hard and I am actively involved in rigorous trading research with national and international bodies (IFTA/SIAT). But again, if the answer to successful trading was in Traditional Technical Analysis, why not having a higher number of successful traders? Many have forgotten that the market is the sum total of the behavior of its participants. An most do not know that the composition of participants has greatly changed in the years. In fact, in some markets computer-based algorithms exchange more than 80% of the overall volume. Indicators, patterns and the technique of technical analysis are used for measuring the markets health, not so unlike the way a doctor measure the temperature of a patient with his thermometer, or the measuring tape to a carpenter. They are just tools. If you comprehend this concept, you also understand that you need to start to looking at the market differently! And if you are just starting, I advice you to not learn technical analysis at all! If this statement may see extreme and controversial, just think of a big work that will need to be done to “unlearn” certain concepts and believe. That work is just “massive”, and some people seem not able to get over and “set aside” all the “art” and methods – that do not work. Why I say that? It has been hard for me to “let go” to the method and concepts and techniques I have learned during the years to embrace different ways of looking at the markets. In the end, I was successful, and looking back I was able to accept that some knowledge can ‘hurt’ and ‘damage’ me more than make me successful. This may well be one those rare cases where ‘ignorance’ is actually and advantage. So my suggestion is for you to look where other do not look. To ways of looking at the market that are more aligned and in-gear with the modern markets work. And there is a lot going on in modern markets that is not explained at all by the methods and techniques of Technical Analysis. If you want to learn more on different ways of looking at modern markets, have a look at the Education section of my blog. Please let me know what you think about the content of this article. Go ahead, leave a reply in the form below.